Five Covenanters, James Bennoch, Robert Edgar, John Gibson, Robert Grierson and Robert Mitchell, were in hiding here on 28 April 1685 when they were captured and shot. Four of them were buried in the kirkyard at Glencairn. 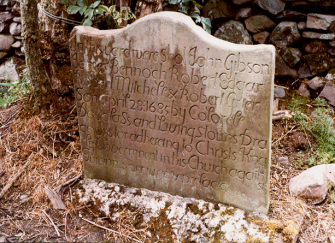 It was not known from where Robert Grierson belonged, so he was buried on this spot. The small headstone is located behind a stone dike in what was the garden of the farmhouse.